Although buildings may be mute spectators, they hold the life of the city. I love to watch the light play on buildings, and the way the same light illuminates different parts of the buildings in different ways – the window, door, motifs on the wall – they all give out a different feel in the same light. That’s not all. The same building looks different at various times of the day. I love to capture this sight and highlight its beauty by recreating these marvels. I use a vibrant color palette that ranges between being bold and subtle to portray the beauty of these structures. Suresh Gulage is a Pune based artist. He has completed his diploma in Art Education and in Painting from Abhinav Kala Mahavidyalaya, Pune. He seeks to build an identity for himself through painting architectural landscapes and buildings, often using a vibrant colour palette and technique that oscillates between being in-the-face to subtle. Suresh has been awarded by Chitari Academy (Pune), Nashik Kala Niketan (Nashik), On-the-spot Landscape Competition (Kolhapur) and by V.V. Oak Pune in the professional category. 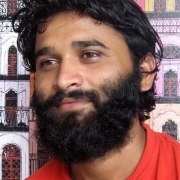 He has held several solo shows – some of them being Pradarkshak Art Gallery (Mumbai) and Gandhi Art Gallery (Pune). He has over 50 group shows and other participations in reputed galleries throughout the country to his credit. His work has been displayed at the State Gallery of Fine Arts (Hyderabad), Nehru Art Gallery (Mumbai) and the Bajaj Art Gallery (Mumbai) to name a few.